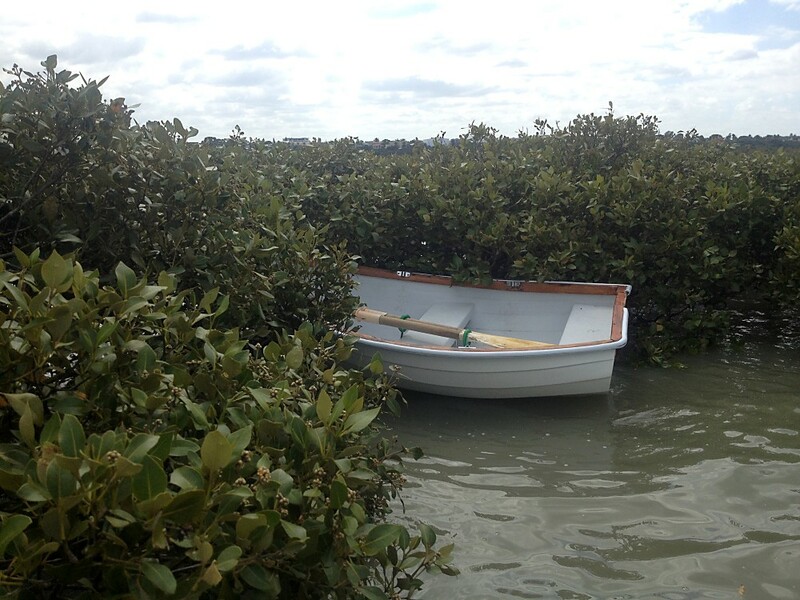 Almost a year after my post about meandering among Motu Manawa’s mangroves with Ms Meduna, I was in the vicinity again, not in a kayak but a dinghy. I was there to search for an escapee named Earl. Earl is a clinker-style dinghy that belongs to my son Jeremy. The name comes from a poem by Louis Jenkins that we had both been enjoying at around the time he bought the dinghy. bewhiskered face bobs to the surface. toward you out of the deep? One night in March, Jeremy was aboard his yacht, Peer Gynt, on a mooring off Northcote Point, near the Auckland Harbour Bridge. Just before he went to sleep he checked the dinghy, only to find his knot had come undone and the dinghy was nowhere to be seen. About 11pm I met him at his boat with another dinghy and we poked around under the harbour bridge to see if Earl had gone ashore there. No such luck. There was a decent north-east breeze blowing, and the angle was such that the most likely path of an errant dinghy would be between the harbour bridge caissons and up the harbour to Te Atatu. 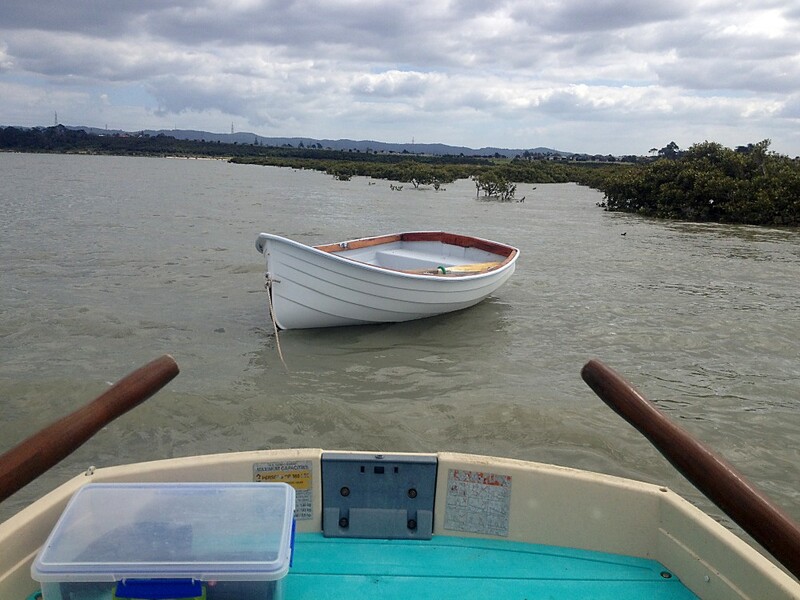 Next day, at high tide, I rowed along the Te Atatu coastline for an hour, checking with binoculars all the bays and nooks where a dinghy might have fetched up. I looked at the stretch of mangroves leading to the mouth of the Whau River and Motu Manawa and thought, might as well check since I’m here. Blow me down, there was Earl, tucked neatly into the mangrove foliage, oars neatly stowed, nothing the worse for a night on the harbour. Turns out that the line “It’s Earl again” is pretty apt. Earl has done a runner twice more, owing to knot malfunctions. Once the police found him and brought him back. The third time Jeremy swam for him. That dinghy rope has now been retired, replaced by a grippier one. Earl’s days of rowlocking roving may be over—but who can say?